MALACCA, Malaysia—According to Buddhist scriptures, there is a flower called the Udumbara flower, which blossoms once every 3,000 years. Udumbara is a Sanskrit word; it means “an auspicious flower from heaven.” The appearance of Udumbara blossoms is a sign of the arrival of the Holy King Who Turns the Wheel, rectifying the Dharma in the world. Buddhist scriptures also recorded that the Holy King Who Turns the Wheel is an ideal king who will rule the world not through force but through justice. Regardless of one’s religious affiliation—Buddhism, Christianity, Confucianism, and so on—anyone who offers compassion to others will have the opportunity to meet the Holy King Who Turns the Wheel. In the past two decades, people around the world have encountered a flower that is believed to be the Udumbara. The flower was first found in Korea in 1997. Later, it appeared in China, Taiwan, Hong Kong, Korea, Malaysia, Singapore, Australia, and America. 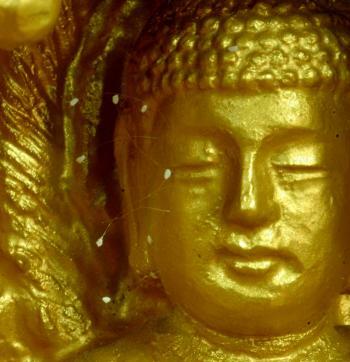 It has been found to grow on other plants, metal, and Buddha statues. However, some experts think that people have mistaken eggs of an insect called the green lacewing (Chrysopa) to be Udumbara flowers because of their similar appearance. The larvae of lacewings are called aphid lions. When laying eggs, the female oozes sticky glue and lifts up its belly to form a slender stalk. White eggs are laid on the slender stalks to keep the young larvae from eating each other after they hatch. 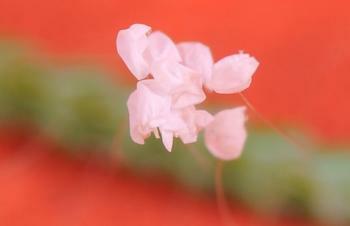 The alleged Udumbara flower is of a size similar to lacewing eggs and also sits on a slender stalk. Mr. Li, a resident in Malacca, Malaysia, discovered both the flower and the egg. 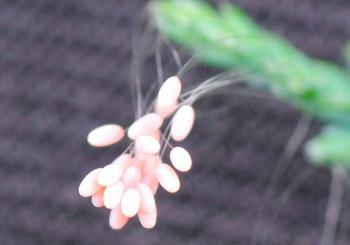 The discovery can serve as proof that what people believe to be Udumbara flowers are not lacewing eggs. On June 25, 2009, Mr. Li and his friends noticed over 20 tiny white flowers on pomelo leaves along the path of St. Paul’s Hill, a scenic spot in Malacca. At first sight, they looked like the legendary Udumbara flowers. Because of the striking similarities between Udumbara flowers and lacewing eggs, Mr. Li brought the flowers to a friend’s place where they viewed the flowers under a microscope. When his friend took pictures of the flowers using the microscope, the petals and stamens were clearly visible. The pictures offered solid proof that what they discovered were indeed flowers. A week later, Mr. Li returned to the same location and found some white grains similar to what he found last time. Again, he took pictures of the tiny objects using a microscope. This time, no matter which angle the pictures were taken from, neither petals nor stamens could be seen. All that was visible were equally sized elliptical grains like lacewing eggs. Over time, Mr. Li observed that the flowers retained their pure white color, but the lacewing eggs gradually turned black and their elliptical shape did not change. Every culture has its myths—tales of monsters and humanoids, spirits and apparitions both friendly and fearsome.